Stradivarius started out in 1994, sporting that treble clef logo which is now a hallmark of the brand. With Spanish roots, Stradivarius certainly has its own unique style and authenticity. With a passion for fresh trends, there is energy throughout the whole Stradivarius catalogue. From the apparel, through to shoes and accessories - men and women alike can count on Stradivarius to nurture their own sense of style with newfound looks. When fashion is your lifestyle, you need a brand that 'll keep up with your personality too - rest assured - as with Stradivarius, you've met your match! At Stradivarius you can shop clothes with a little attitude, tops and t-shirts that speak out loud, trousers that are cut to be bold and accentuate shape alongside your everyday denim and clothes to rival your Sunday bests. With all the trending accessories you could wish for, you can make your every look sing with the simple addition of a belt, or indulge in a new backpack to bring some city cool back to your work wardrobe. Men can shop sneakers galore, with technical numbers in muted and chic colours available to make every outfit casual cool; while ladies can find trainers too alongside killer feels, rockin' flats and more types of shoe to add to your collection. With seasonal collections available, you'll always find the holiday shop you need and with awesome Fashion Edits, and even a Trend Alert section to inspire you, you'll always be on a good streak with Stradivarius. 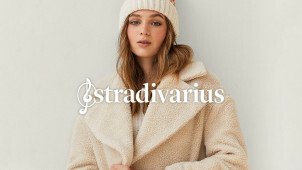 How do I use my Stradivarius discount code? Choose your offer and copy your discount code before clicking ‘Shop Now’. Shop your garments on Stradivarius.com, adding them to your basket. Go to your cart to process your order and enter your discount code where indicated. Click ‘Apply’ to redeem your discount and continue with your savings. Sign up to the Stradivarius newsletter and be the first to know about new collections, news and special offers. Where is my nearest Stradivarius store? The store locator will let you find your closest Stradivarius store. What size should I order at Stradivarius? You can find a size guide on each product page to help guide your choice in Stradivarius clothing. Is there a Stradivarius sale? We’ll let you know about seasonal clearance sales, you’ll be able to find a sale section online too for both men and women. You can pick your order up in store for free, and Standard shipping is free on orders over £50. Express, same day and even an eco standard or eco express home delivery option is available. 30-days free returns from the order date. Email Stradivarius from the contact page. Keeping the masses on trend is what Stradivarius does best. This Spanish born brand has a unique know-how in style and design; with a little help from these trend setters and a Stradivarius discount code, you’ll be able to stand out from the crowd in outfits you love. Whether you want clothing, shoes and accessories for everyday, or perhaps a fragrance or something for the home - let Stradivarius be your destination of choice for those dreamy goods. Download the Stradivarius app to your smartphone to shop this stylish and unique brand on the go. Letting you browse the full collection, you can even choose your favourites to create a personal wish list to take in-store. With quick access to your receipts and more on your device - this is a good way to keep an eye on your spending too! To complete every one of your looks to perfection, opt for a coat or jacket from Stradivarius. Hosting options that will keep you on trend all year round, a Stradivarius promo code will let both men and women save on this wardrobe essential. Whether you’re looking for a classic denim jacket, a hipster leather jacket or a knitted number - whatever the season - you’ll be stepping out in both a functional and fashionable piece.